Denver’s status as both a sophisticated urban center and a renowned location for outdoor adventure is well-known to visitors and residents alike. But did you know that the Mile High City is also home to a thriving artistic economy? It ranks number one in the nation for visits to cultural centers, and this Independence Day the city delivers on its reputation with a wide array of featured celebrations that are designed to inspire feelings of freedom and fun, and help you create priceless memories with your family and friends. Take a look at these five community events that combine creative sights and sounds for an unforgettable Independence Day in Denver. Greenwood Village sits about 10 miles south of Denver and plays host to this fun-filled concert under the stars at the Fiddler’s Green Amphitheater. Hear the sounds of both classic and contemporary scores such as the Overture of 1812 and Stars and Stripes Forever set against a backdrop of fireworks and the Rocky Mountains in the distance. Advance tickets are available now for this breathtaking show. Travel across America with this IMAX musical extravaganza which traces the places where culture and music intersect to form the unique and innovative sounds that helped shape our nation. This foot-stomping, soul-stirring cinematic epic plays at 11:30 a.m. and 3 p.m. on July 4th at the Denver Museum of Nature and Science, and daily through September 6th. While you’re there, you can also check out the museum’s numerous exhibitions and state-of-the-art planetarium productions. 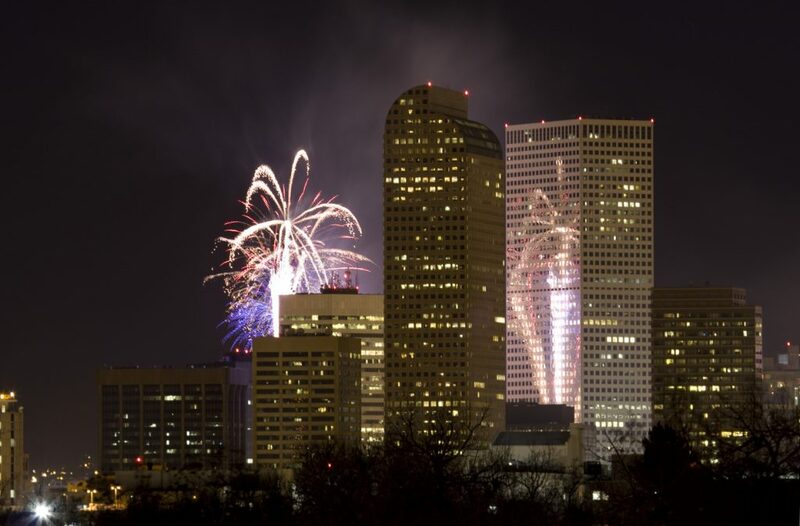 On July 3rd, downtown Denver kicks off the holiday with its 9th annual light show and fireworks concert featuring Colorado Music Hall of Fame inductees Chris Daniels and the Kings and the 101st Army Band of the Colorado National Guard. Kickoff time for this free community bash is 8 p.m. at Civic Center Park. You can also catch fireworks at Elitch Gardens Theme and Water Park on Independence Day in Denver. Spend a day of fun and thrills on the park’s 53 roller coasters, water slides, and attractions, then watch the downtown Denver Skyline light up with color starting at 9 p.m. Finally, if you’re a Neil Diamond or Firefall fan, you won’t want to miss the Hudson Garden and Event Center’s post-concert sparklers: on July 3rd tribute band Super Diamond plays the star’s biggest hits, and on July 4th see Boulder’s long-running rock sensations light up the outdoor Summer Concert Series. Both shows start at 7:30 p.m, with fireworks following the concerts. There’s no shortage of musical talent at Colorado’s most famous outdoor theater on Independence Day. Southern-soul rock sensations Blues Traveler headline this star-studded event that also features G. Love & Special Sauce, The Wailers, and The Devon Allman Project with special guest Duane Betts. These talented artists cover the spectrum of musical genres, playing everything from alternative hip hop and reggae to indie, folk, and blues rock. Doors open at 4:30 p.m. at this acoustically superb theater aptly nicknamed the “Garden of Angels”. The Denver Outlaws were the first undefeated team in Major League Lacrosse history, and there top-seated MLL standings set the stage for this east vs. west matchup against the Boston Cannons. Action starts at 7:00 p.m. at Sports Authority Field, and each year after the game the league gifts fans with a ‘Mile High 4th of July‘, featuring stunning visuals amplified on the 220-foot-wide HD screen. Come out and see if the Outlaws can keep their ranking and represent the city at the August 18th Championship Game, and then enjoy a spectacular pyrotechnics display. Independence Day in Denver will be unforgettable so make sure you don’t miss it!